It’s all horses and flowers at Calero County Park. 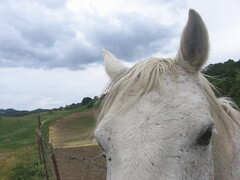 Calero, near the southern edge of San Jose, is one of Santa Clara County’s most popular equestrian destinations – it even has corrals and horse quarters. Its spring wildflower show (still a few months off, alas) is one of the best in the South Bay. Hours: 8 a.m. to sunset all year. Limitations: Horses and hikers only; no bikes, no dogs. Fees: Park free at the trail head. Driving directions: From Highway 101, take the Bailey Road exit and head west 2.7 miles to McKean Road. Turn left and follow the signs to the trail head. So, what’s in it for hikers in rainy January? Well, rain-softened trails are often closed to horses in the winter months but still open to hikers, so you can have its wide expanses of oak woodland and ridges overlooking the nearby mountains all to yourself on many days. Calero’s great for quiet, contemplative walks in the woods, but it has more direct benefits: It’s easy to find and easy to hike. There are plenty of flat trails for beginners, a few shady hill climbs for intermediate hikers and a couple options for 10- to 15-milers for the more energetic. Standard precautions: Calero is best avoided if you’re afraid of horses (or hate stepping over their poop). The best trails are shaded, but you have to walk through open sun to reach them, so bring sunscreen. Poison oak is common on single-track trails. Hiking in the summer heat is not advised. Give the trails a few days to dry out after major rains, or you’ll be ankle-deep in mud. goes a couple miles deep into the park with few major inclines. Moderate: Cañada del Oro and Chinantuk Peak trails are steep but reasonably short routes snaking through the woods up to the park’s highest point along Bald Peaks Trail. Javelina Loop passes a nifty bat enclosure. These are all between four and six miles. Hard: If you make it up to Bald Peaks, Serpentine Loop Trail is worth a look – it’s 3.2 miles with 900 feet of elevation loss and gain, and not much shade – so be sure you’re up for it before setting out. You can get in an eight- to 10-miler out this way, depending on your route.